This year’s Vuelta will be remembered both for the quality of racing as well as for the misdemeanours of certain race officials and support staff (a few moto riders in particular). But for us it’s a tour that will be remembered in the main for the sheer amount of youthful G.C. 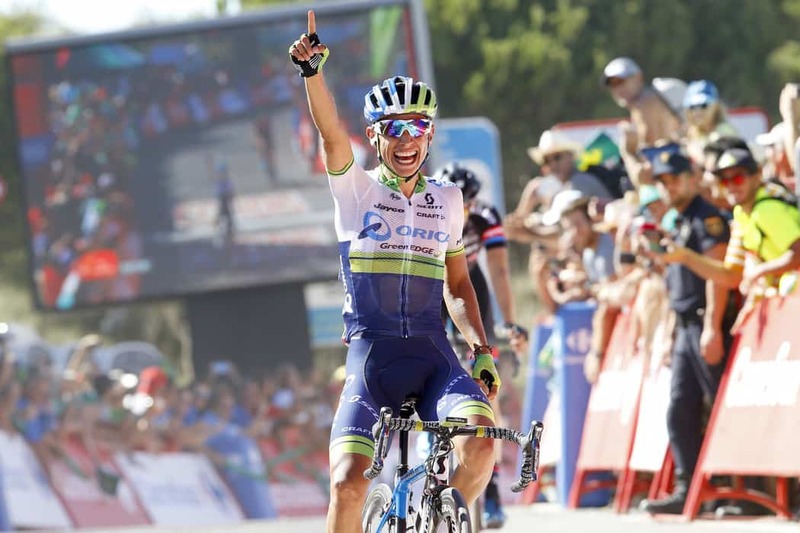 contenders who gamely rose to the challenge of La Vuelta. The old guard were present throughout: even after Froome and Nibali bowed out of the race, Valverde and Rodriguez were always present at the head of the pack. But they were toppled, in the end, by a group of fresher, younger riders working their way up the G.C. rankings: Aru, Quintana, Majka, Chaves, Dumoulin, and Meintjes. Rodriquez and Valverde were no pushovers. The two Spaniards instigated some of the finest and most gripping racing of the tour, with Purito taking Stage 15 and Valverde winning on Stage 4. But when 6 out of the final top 10 ten on G.C. are 26 or under, it shows that the future of cycling is bright — even if some of the results of the tour might inspire a little cynical speculation. Lance Armstrong still casts his shadow over our beloved sport, but with around twenty positive doping tests so far reported this year, some degree of cynicism is not out of step with realism. After three brutal and exciting weeks, the wearer of the red jersey come Madrid was Fabio Aru. His breakthrough in professional cycling came last year, when he finished third at the Giro d’Italia and fifth at the Vuelta. He went one better at this year’s Giro, finishing second to an on-form Alberto Contador, and now stood tall atop the podium in Spain. He has visibly learnt a lesson or two from his Giro experience, keeping his team around him at all times this Vuelta, and making more planned and calculated, and less opportunistic, attacks on the bunch. His Vuelta campaign was also no doubt helped, and not hindered, by the disappearance of teammate Vincenzo Nibali, who was caught hitching a lift on stage 2. Thus any rivalry or in-fighting over the role of team captain was swiftly annulled. But as we noted in our stage 20 report, Aru’s victory comes at least in part courtesy of a drained and declining Tom Dumoulin. This is not to discredit Aru’s performance too greatly, as Dumoulin’s own display in this Vuelta was frequently brilliant, and he looked more than likely to take the win up until the penultimate stage. Ultimately, though, Astana’s performance was a little less dazzling but a lot more consistent than Dumoulin’s. So, when Dumoulin eventually faded, all the other general classification riders (and not just Aru) were able to regain handfuls of time on him. Before this year’s Vuelta kicked off, the bookies had Dumoulin at 500/1. He now stands at only 20/1 to win next year’s Tour de France. Those numbers say something about the transformation that seemed to unfold in front of the world over three weeks on Spanish roads. At the start of the race, the Dutchman was only spoken about in reference to the Stage 17 time trial, for which he was strongly fancied. But by the time that that stage rolled around it seemed to be a different rider who took to the start ramp. It was on stage 2 that we had a glimpse of what he was capable of becoming when the butterfly of Maastricht (possibly the single worst media nickname in the history of the sport) first came out of his cocoon. It was the first display of Dumoulin’s till-now hidden climbing abilities, as he turned around his pedals like the windmill (moulin) of his name. He was beaten on that day by Esteban Chaves, himself another revelation of this years Vuelta, and the two of them enacted a comedic ‘little & large’ 1-2 finish. On stage 5 there was a 6 split in the group, and Dumoulin finished on the right side of the gap to pull on the red jersey for the first time — taking a one-second lead over Chaves. This was for now short-lived, as the Colombian would reprise his lead the very next day, and would then hold on to the jersey till stage 9. Stage 9 was Dumoulin’s real moment of revelation, and the sounds of jaws dropping nearly outdid the noise of the crowds at the finish in Cumbre del Sol. In what was something of a trend in this year’s race, the first two-thirds of the stage were flat and uneventful, before a category 2 served to wake up the riders in time for a final category 1 grind. Naturally, all the talk before the stage focussed on how much time Dumoulin would lose to the serious climbers; Froome, Aru, Majka, Rodriguez, Valverde. As they all started the climb it seemed that both Froome and Chaves were having an off day, so Dumoulin took his chance to go on the attack. A noble effort we thought — go down fighting, do the jersey proud. But he went up, not down. Valverde followed Dumoulin’s wheel and the two led the rest up the final climb. Froome then revealed he’d been riding his own race, and was now back amongst the final selection. Majka, and then Rodriguez, launched attacks but each time Dumoulin kicked and fought them off. Froome looked to a have ridden the climb to perfection, throwing in his own attack in the final kilometre. He found space between himself and the chasing group, and it looked like Froome was well under way for a first stage win and the first move in his double-G.C. campaign. But then, seemingly out of nowhere, Dumoulin started gaining and then surpassed Froome. Dumoulin went on to win that stage 14 seconds ahead of Froome and, thanks to a broken Chaves, he also took back the red jersey. The stunned babble of Carton Kirby, commentating in disbelief ‘big man’ crossed the line, adequately summarised the thoughts of the cycling world. Had we truly just seen a time-trial powerhouse breeze past the current Tour de France champion at the peak of a dizzying climb? In the space of 4km, Dumoulin had shed his time-trialist’s reputation and had uncovered his climber’s legs. From then on it was damage control mode for Dumoulin and Giant-Alpecin, knowing that Dumoulin couldn’t commit to the heroics of stage 9 every time the road went uphill. Besides, if he could stay within two minutes of the leaders across the mountain stages, he would have a clear shot at the general classification come the time trial. He rode his own race during these stages, not allowing himself to be be provoked into following the attacks from his new rivals, and he calmly let Aru and then Rodriquez take possession of the red jersey. As predicted, he posted by far the best the time trial on stage 7 to take back the jersey. This shot of him flying past Mikel Nieve is the perfect display of his speciality on a time trial bike, effortlessly finding a superior aerodynamic position as he thundered up the road. The fairy tale continued on stage 18 and 19, where the G.C. contenders had eyes only for each other — allowing the breakaway to win both stages. Dumoulin stuck to Aru’s wheel as if glued in place, and even managed to take a few more seconds on him on the cobbled climb to the finish of stage 19. Going into the final day for the G.C. he led the race by 6 seconds over the Italian. But this is where the fate intervened, and the natural order of things were reinstated over the vaulting ambition of young Dumoulin. The stage reached the third of four category 1 climbs and Astana had played a brilliant game of chess, with riders in the early break perfectly poised in the endgame to help their leader. Dumoulin had no team mates around him, with his Giant-Alpecin team lacking the grimpeurs needed to support their leader. Aru attacked and his team drove the pace up the climb; Dumoulin had no response. The Kazakh team pulled back more of their riders from the breakaway and kept pushing on, all the while isolating the suffering Dumoulin. As the group reached the fourth and final climb, the gap back to Dumoulin was already three minutes. And when Dumoulin had no strength left, all the other G.C. men thrived, each taking back some time on the race leader. When Dumoulin crossed the line he was nearly four minutes down on Aru, and had slipped to 5th in G.C. His race was lost, but his performance over the three weeks was the stuff of cycling legend. Few would have believed you had you said, pre-Vuelta, that Dumoulin was destined for a top ten finish — let alone that he would be one stage (or two mountains) short of taking the red jersey. But that’s precisely how his race unfolded. Only the Dutchman and his team knew of the potential hidden within his lumbering frame, and now the whole of cycling knows it. What will he produce in 2016? The most popular rider in this year’s Vuelta and a favourite with us here at Marmeladrome. The pint-sized Colombian and his Orica-GreenEdge team lit up the first week, as is now their Grand Tour tradition.The plan didn’t work out as usual though, as they lost out to BMC in the opening team time trial by one one-thousandth of a second. But they needn’t have worried, as Chaves let off a box of fireworks on the Alto de la Mesa, and gave him and the team their first stage win and first red jersey of the race. Chaves’ performance on stage 2 didn’t shock in the same way as Dumoulin’s would. Back in 2012 he took a stage win and placed 3rd on G.C. at the Vuelta a Burgos, followed by two summit finish wins at last year’s Tour de Suisse and Tour of California. He also wore the young riders jersey at this years Giro. Orica were thus well prepared to keep him protected and always at the head of affairs during stages 3 and 4. On stage 5 the team’s focus was on Caleb Ewan, and the young Aussie sprinter duly took the win in impressive fashion, beating both Sagan and Degenkolb. However, an eagle-eyed commissar saw that a gap had opened within the finishing peloton, and Chaves lost one valuable second — costing him the jersey, which was taken up by Dumoulin. If Dumoulin’s defining moment came on stage 9, then Chaves’ came three stages earlier on stage 6. It was a stage of continued ascending from 30km in, which, coupled with the heat that day, made it a break-friendly stage. A decent break formed featuring the likes of Cummings, Terpstra and Velits, but by the start of of the final ascent, 20km from the finish, they led by only a minute. With 12km remaining, Cummings launched his attack, and as he reached the foot of the Alto de Cazorla, it was GreenEdge leading the chase. With 3km to go and the road pitching up at 15%, Chaves launched his attacked and streaked past Cummings, who had now all-but ground to a halt. He opened up a gap of around 15 seconds, and, despite a spirited attack by Dumoulin, the gap stuck, allowing Chaves to take his second stage of the week. What became apparent when watching GreenEdge’s Backstage Pass video for that stage was the genuine love and emotion that Chaves and his team have for each other. Watching directeur sportif Neil ‘The Sheriff’ Stephens talk him up the final climb in the Spanish tongue was truly inspirational. Chaves kept the red jersey until Dumoulin’s display on stage 9, and after that it was not to return to his slender shoulders during this year’s race. However, we fully expect him to be met with success in future years and future tours. After that explosive first week, Chaves fell into something of a supporting role alongside the main stars that were Aru, Dumoulin, and Rodriguez, but he remained within reach of the podium till the end. From stage 15 onwards it was clear that the second week had taken its toll, as Chaves had lost 1 m25s going into the second rest day. He finally finished 2m 43s behind Dumoulin in the ITT. By his own admission he and the team had already achieved more than they set out to do, but to think that mean’t he had eased off would be to do him and Greenedge a massive disservice. They kept on fighting each day, but he was just up against better men who could go the distance over 3 weeks. Esteban will also be one of those men, if not next year then the year after. He remained 7th on GC until Dumoulin’s implosion on the final stage, which meant he moved up to 5th overall at the close of the race – which sealed the best performance of his career to date. It’s well know that since the start of his career Nicolas Roche has always peaked towards the end of the season; the Vuelta is a race where he took his first and only Grand Tour stage win in 2013 and finished 5th and 7th on G.C. in 2013 and 2010 respectively. In July he was one of the key men in Sky’s Tour de France-winning team and it seemed as if the first week of the Vuelta was his reward for that effort. He was given full freedom and allowed to leave his team leader, Chris Froome, and to follow the attacks of the other G.C. contenders. He was part of the winning moves in stages 2 and 4, where in the latter his attack looked likely to give him the win. But it was instead the springboard for Valverde to slingshot past him on the final bend, followed by Sagan and Moreno, leaving Roche off the stage podium. By stage 9 he was third on G.C., 36 seconds behind Chaves, but it was on this stage that Froome recovered his Tour winning legs once more, and he returned to his role as loyal lieutenant; a crash kept Roche ou of stage contention. Roche suffered another crash the following day, this time with more visible damage, so it was a battered and bruised Irishman that found the first rest day. Stage 11 was billed as the tour’s toughest, with its six peaks and over 5000m of climbing. As it turned out, the G.C. men played it safe and allowed the breakaway to rule the day, which in turn let Landa take the win. Team Sky’s Ian Boswell finished third and it was the grand tour débutante who was the team’s highest placing rider on the day. This was due to Froome and Roche having a torrid time in Andorra, with the former crashing early on and as a result fracturing his foot which we would see him not sign on the following day. With Froome out, Sky’s race plan changed. They still had a man well placed in G.C., with Mikel Nieve only 1 minute 58 minutes back from Aru. But any real hopes of taking the overall win had departed with Froome. That meant that the team were now out for stage wins as well as trying to keep their lead in the team classification. On stage 13 Roche was out in the break, but was beaten to the line by Nelson Oliveira’s solo attack 30km from the line. The Irishman rolled in in third place, one minute behind the Portuguese rider. Roche then rode a fairly quiet race until after the ITT, when on stage 18 he and 24 others formed the morning’s break. They took advantage of the G.C. men who were focusing on their own race. It was at just over 16km, as the break reached the summit of the Cat 1 climb of the day, that Roche launched his attack. Haimar Zubeldia of Trek Factory Racing was the only man to follow and, whilst a number of other riders tried to bridge across to them, it was these two that passed under the 1km to go banner and the cat and mouse games began. Although Roche found himself in the lead-out position, Zubeldia showed lacklustre sprint skills and offered no real challenge to the Irishman. With a quick increase of speed in the final few hundred metres, Roche took a celebrated win. This was his second in a grand tour, and finally gave Sky a good reason to smile in Spain. Roche looks well prepared to fill the shoes of Richie Porte at Sky, but there is uncertainty as to whether he will get the chance to be leader in a grand tour, with the team already spoilt for choice. But, as Roche is a capable climber, explosive sprinter, and tactical finisher, we hope he is able to take shots at stage wins in the upcoming season as he was in the Vuelta. Great write up. I don’t think you gave enough credit to Tom Dumoulin. The reason Aru won was because he had a strong team to support and push him. Dumoulin had no one and despite this he still challenged until the penultimate hill. Put him in a strong team and he’ll be able to compete right until the end. Does anyone else think Aru looks like a Fraggle when he’s pushing it? Thanks, you’re right, perhaps we were a bit stingy with our praise for Dumoulin. Difficult to imagine which teams could accommodate Dumoulin but don’t already have G.C. hopefuls. Maybe Etixx could work a team around him with the likes of Alaphilippe and Uran (the latter would take some persuading though…).